Researchers identify the enzyme responsible for obesity-related high blood pressure. Obesity is a serious health problem affecting approximately one-third of the adult population in the United States. Obese individuals have an increased risk of diabetes and cardiovascular disease, including hypertension. A recent study led by researchers at the University of Missouri has identified the enzyme responsible for obesity-related hypertension, a finding that could lead to new treatment options. The study is published in the journal Obesity. The team explain that hypertension is a condition in which arterial blood vessels are exposed to persistently elevated blood pressure, making the heart work harder to pump blood to the body. Hypertension can lead to severe health issues such as heart attacks, kidney failure, organ damage, and weakened or ruptured blood vessels. By comparing genetically obese rats to lean rats in the current study the researchers discovered that obese animals were deficient in the amino acid arginine due to elevated activity of the enzyme arginase, which breaks down this molecule. Although arginase is present throughout the body, it is primarily found in the liver, state the team, adding that its role is to assist in the breakdown of ammonia, which is eventually flushed out during urination. However, the lab found significantly increased arginase activity within blood vessels and in the blood of obese rats compared to lean animals. The problem with this data finding state the researchers is that arginase depletes arteries and blood of arginine, which is needed to generate nitric oxide. Nitric oxide is a gas formed from arginine that relaxes blood vessels and lowers arterial blood pressure. The destruction of arginine by arginase reduces nitric oxide levels, leading to the constriction of blood vessels and high blood pressure. Using two methods to correct the arginine deficiency, the team first supplemented the diet of obese animals with the amino acid L-arginine. The second method involved using drugs that block the activity of arginase. Although both approaches restored nitric oxide production and reversed hypertension in obese rats, the use of arginase-inhibiting drugs may be a better solution. The results showed that blocking arginase activity offers a more specific approach in treating hypertension, because it’s directly targeting the underlying biochemical defect in obesity. L-arginine is a natural amino acid commonly found in red meat, poultry, fish and dairy products state the team and it is also manufactured and used as a nutritional supplement or medication. However, the researchers surmise that a dietary approach using L-arginine may not be the best treatment option. Arginine increases nitric oxide, but it also exerts other biological effects, and it can be converted by arginase to alternative compounds that counteract its benefits to the circulation. In future studies, the researchers plan to investigate what causes the increase in arginase activity in blood vessels and in the blood of obese animals.The team hypothesize that identifying the role of arginase in the development of obesity-related hypertension will ultimately benefit obese patients. Obesity is a significant health issue not only in this country, but worldwide and the team conclude that the key to reversing the effects of obesity-related hypertension will be to effectively block arginase activity. This new knowledge may help in the discovery of treatment options for obese patients with high blood pressure. Composite image showing an embryonic heart from a mouse embryo at stage E18.5. The coronary circulation is crucial to the hearts function as it provides blood to the thick muscle tissue of the heart itself. 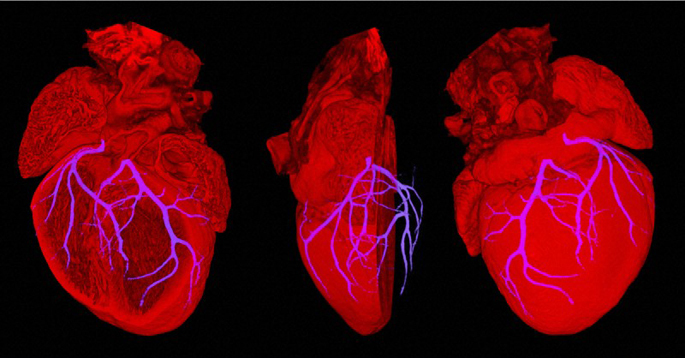 These coronary arteries are very small and difficult to image using standard techniques, they are normally observed by injecting the coronary circulation with a dye and using x-rays to image. High Resolution Episcopic Microscopy (HREM). Credit: NIMR, MRC. Wellcome Images.